"I am an Ashe County native with a humble background just tryin' to make a livin' in the town I grew up in. A lot of people leave, but I'm still here... and for good reason." I always knew I wanted to be an artist and I have been interested in making and selling items since the age of 18 (maybe before). Around then I started an Etsy account. I have sold a few things on there over the past few years under various shop names and themes. Great Southern Gothic came about when a few different ideas melded together at once. Season 3 of the show American Horror Story came out October 2013 and I loved it. It is about witches in New Orleans. I also had recently watched Practical Magic and in the movie one of the witches has an herbal Apothecary store where she sells her handmade creams, shampoos and bubble baths. From a young age I identified with the "witch" archetype of being powerful, knowledgeable, and most of all, mysterious. I always liked mixing up potions. In the Summer of 2014 I decided I wanted to try opening a shop in West Jefferson. The shop would be based around the theme of Southern Gothic and it would draw from different influences of Southern culture, from the haunted Southern Appalachian Mountains down to the Voodoo of New Orleans. I wanted it to be kind of a mix of a general store, Apothecary and art gallery. It's a strange and quirky blend of light and dark. It's a place dedicated to History, alternative Art, ghost stories, superstition, folk magic, and "Old Timey" remedies. A purveyor of all things to satisfy the curious mind. Many local artists currently have their unique and lovely handmade products for sale! 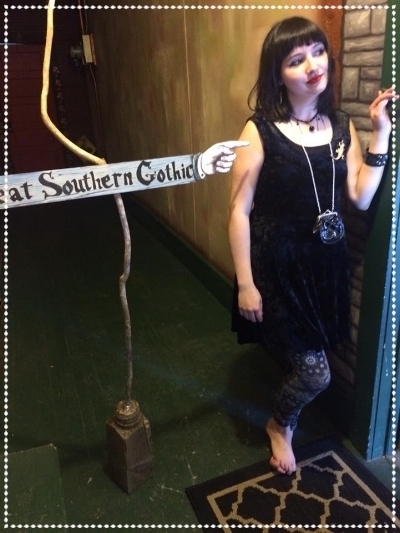 Great Southern Gothic opened April 4th 2015 and the first Escape Room debuted that September. My tagline was, "It's not just a shop, it's an experience." From the decorations, to the displays, the music selection and the overall atmosphere, it is an experience. The building has a white tin ceiling and the doors take skeleton keys. You actually get to use a skeleton key on the doors in the Escape Room. I found an antique dealer and bought some Skeleton keys from him shortly after I signed the lease. Two of them fit in the doors! It felt like a very magical moment and like I was on the right path. I have been open for 3 years now and I have had no idea what I am doing, though I know more than I did 3 years ago. It has been a learning process. I will continue to learn and grow through this process. I am happy to have created a place where I feel comfortable. GSG has become something more than its original idea. It is an ever-evolving art project that I am investing my heart and soul in and I am committed to it. I want it to become a beloved amusement attraction where memories are made for years to come. So, what are you waiting for? Come on up and sit a spell.